The asteroid body has the form of a flattened star with arms (rays) generally numbering 5 or a multiple of 5. It is rare to see six or other number of arms. The arms join a disc like body. The upper surface of the arm has the spines and other Enchinoderm features. There is usually a red eye spot at the tip of each arm. The under side of the sea star has a mouth in the middle of the disc and there is an open groove from the mouth to the tip of the arm. Two or four rows of tube feet are found in each groove. Sea stars travel on the tube feet. 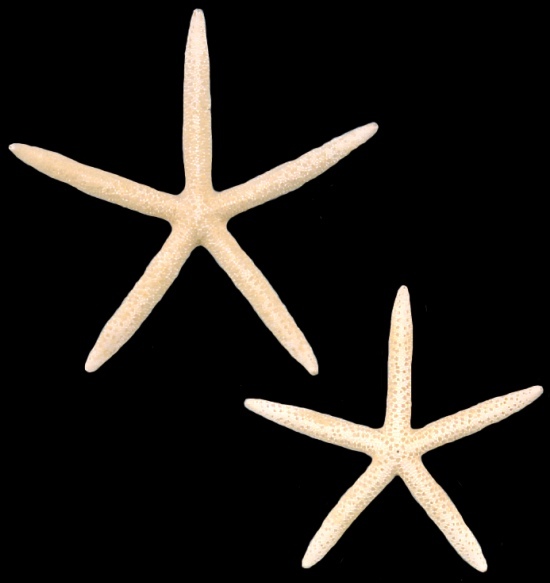 The tube feet has suckers that reach ahead and attach to solid objects; thus pulling the sea star forward. The burrowing sea star lack suckers and only push the sea star forward. Sea stars feeding varies with the species. Most feed by extending their stomachs thru their mouth to envelope their food. 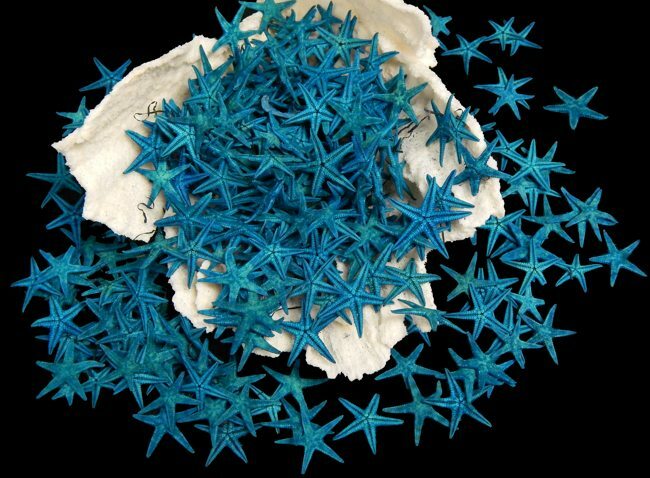 Sea stars can regenerate arms. When an arm is damaged, it is shed at a point close to the central disc. (this is why the species you receive have arms of varying development). If the arm surface is cut slightly, it can usually heal over. In some species, the lost arm can generate a central disc; thus creating a new sea star. The Bahama Sea Star can vary in color. Some are very dark brown and other a light tan color. 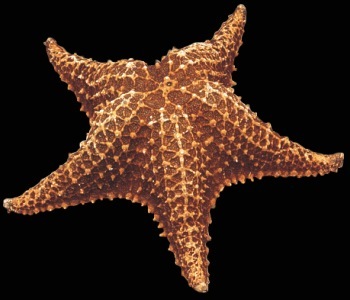 The color difference relates to the amount of sun light the star fish experienced during its life. Generally speaking, the larger the starfish the more imperfections. 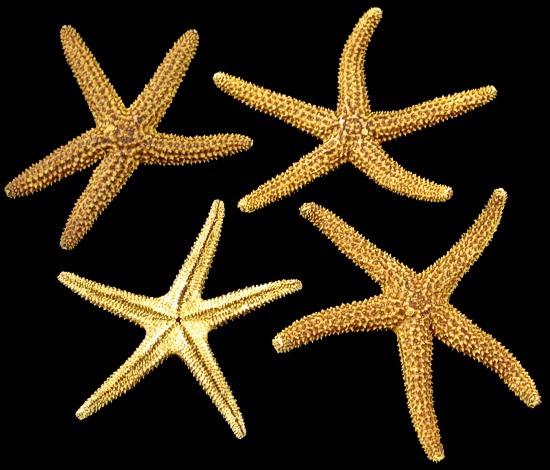 Many starfish are not symmetrical, this is caused by the starfish regenerating lost arms. That is the reason some arms are longer than others. The Crown of Thorn starfish are considered pests. 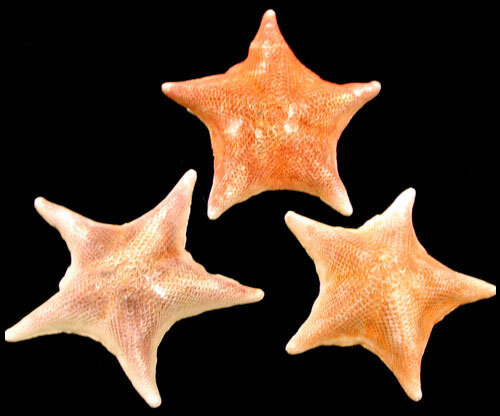 These specimen are from the tropical Pacific near Australia. 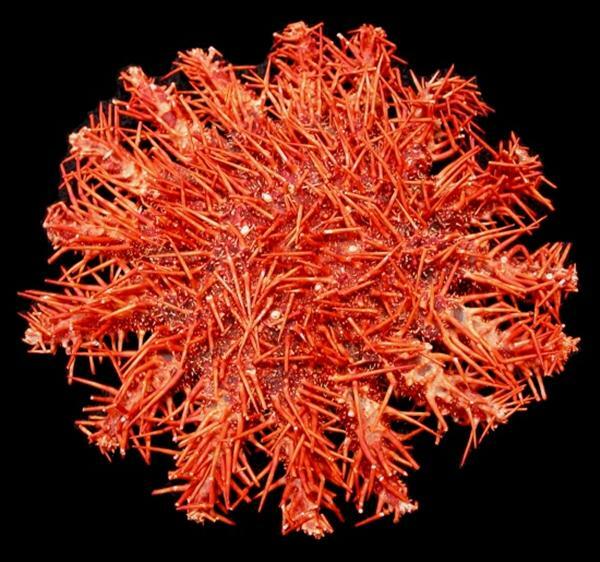 Crown of Thorn star fish attack Coral Reefs and have few predators. Crown of Thorn starfish color can vary depending on how much sunlight exposure they have received. They tend to be more dark brown than redish. These sea stars have been bleached white. 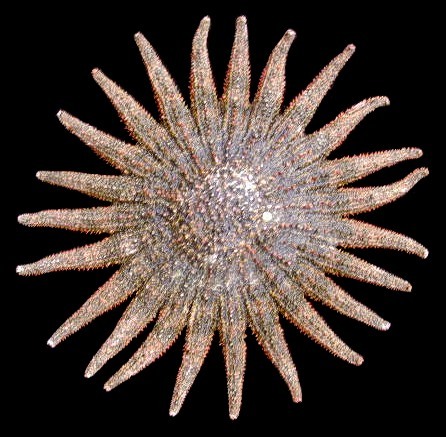 The Bat Star fish, Asterina miniata, is so named because of its resemblance to a bat. 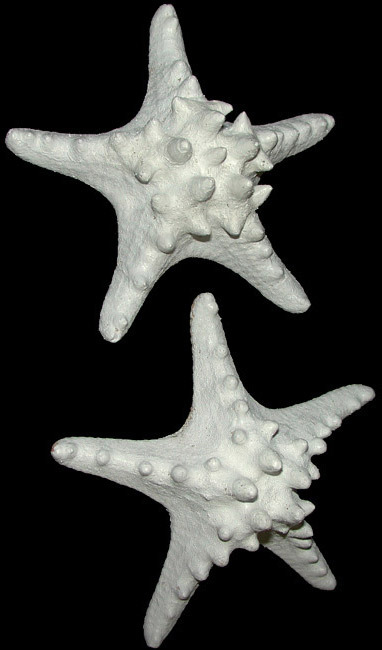 The arms are not as clearly separated as with other species, but more distinct than those of a "sand dollar". They come in a wide variety of colors. Like other starfish they mate by "broadcasting" their gametes (eggs and sperm) into the water. This is roughly synchronized but they do it whether there are other starfish around or not. 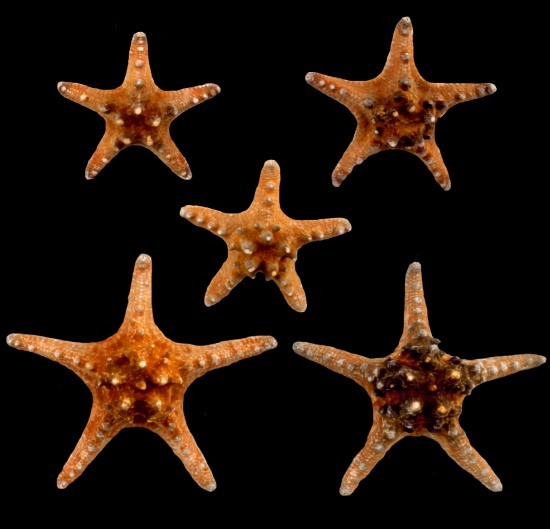 Bat stars are often scavengers but they can also be predatory. Small annelids (worms) liven in their oral grooves. 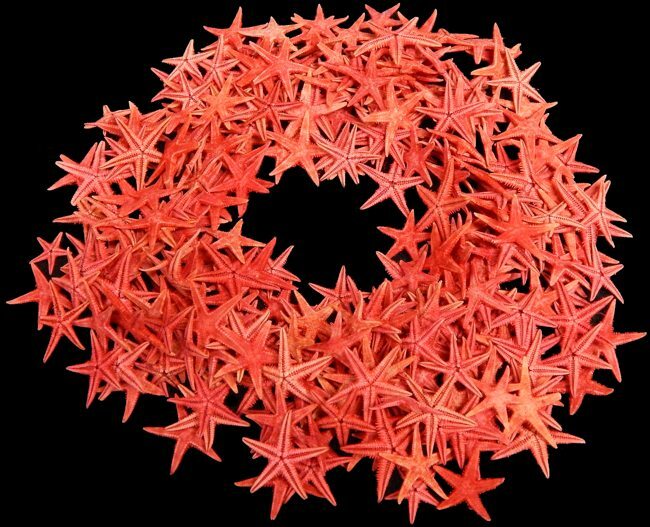 This doesn't seem to harm the bat star, but it is unclear what, if anything, the bat star gains from this relationship. Bat stars can grow to 8 inches across and are found on the west coast of North America from Alaska to Baja California. They have an important role as scavengers. 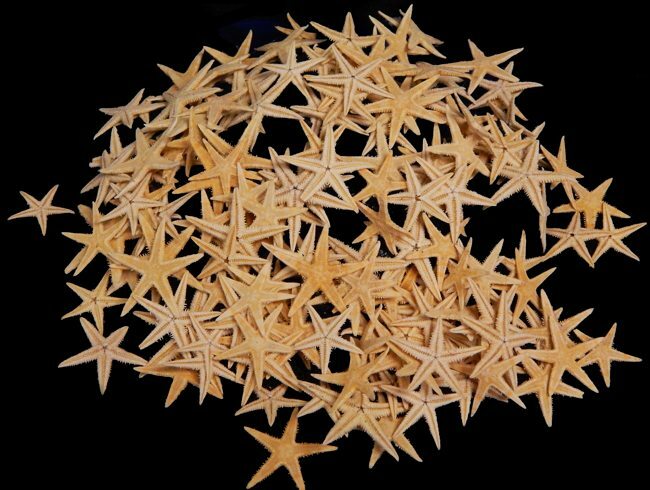 One unusual feature of the Bat Star fish is that the plates that make up its outer skin are so large and well defined that they are quite clearly visible and some have compared them to shingles. 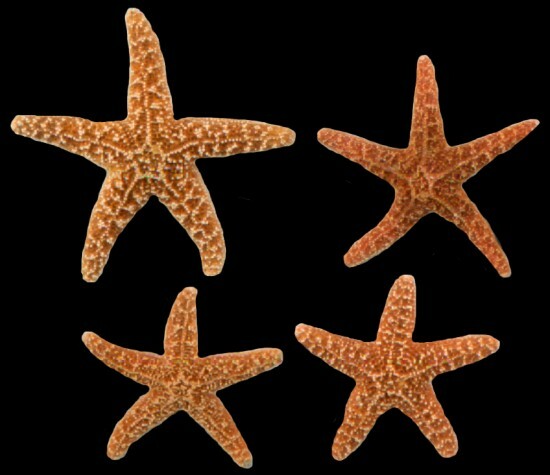 Just as humans normally have five fingers but some individuals have extras, bat starfish normally have five arms but sometimes have as many as nine arms. 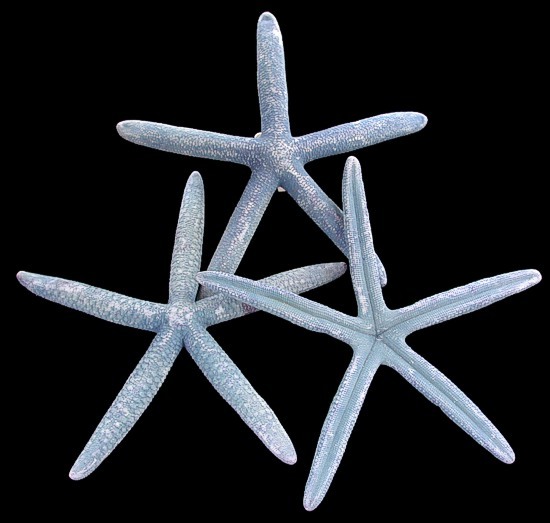 Bat Star fish can be found from the intertidal zone out to a depth of about 950 feet. 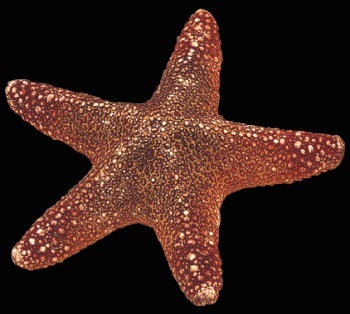 Bat stars are known to eat other species of starfish on occasion. Sometimes fights occur between Bat stars which take the form of arm wrestling where each tries to get its arm on top of the other one. The Pencil Starfish, also called finger starfish. Their natural color is varied shades of blue to blue gray. They are a tropical species, often sold dyed white. 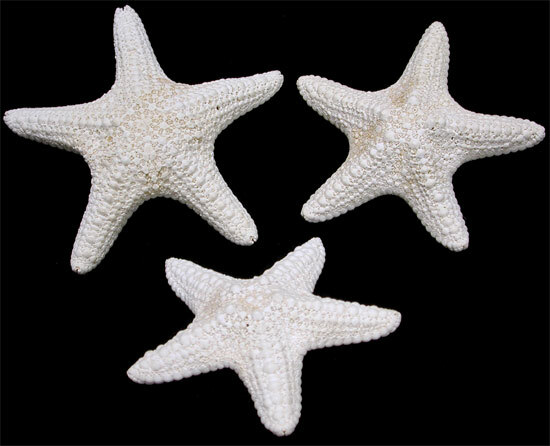 See our listing of white starfish. Generally speaking, the larger the starfish the more imperfections.